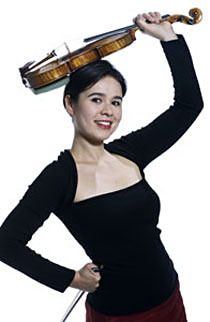 Claire Dolby, violin, read History and Japanese at Cambridge University and before studying at the Guildhall School of Music and Drama with David Takeno. In 1998, Claire moved to Vienna to study with Erich Höbarth and later with Thomas Riebl in Salzburg. Claire has played with the Chamber Orchestra of Europe, the Vienna Chamber Orchestra and Deutsche Kammer Philharmonie Bremen and is currently a member of the Camerata Salzburg and the Tokyo Ensemble. Chamber music experiences include the Open Chamber Music sessions in Prussia Cove and regular appearances at festivals and concert halls throughout Europe and Japan. She recently performed with Maria Joao Pires in Portugal. Claire has also performed with her band “String & Siren” around Austria and Germany and in the Porgy and Bess jazz club in Vienna. Claire has won a scholarship to participate in a Winter Residency in the Banff centre for the Arts in Canada beginning in September.